A Guyanese girl must find the balance between her parents' "old world" expectations and traditions while pursuing her dream of being a great trumpeter in this contemporary, coming-of-age story, written by an #OwnVoices author. Nira Ghani has always dreamed of becoming a musician. Her Guyanese parents, however, have big plans for her to become a scientist or doctor. Nira's grandmother and her best friend, Emily, are the only people who seem to truly understand her desire to establish an identity outside of the one imposed on Nira by her parents. When auditions for jazz band are announced, Nira realizes it's now or never to convince her parents that she deserves a chance to pursue her passion. As if fighting with her parents weren't bad enough, Nira finds herself navigating a new friendship dynamic when her crush, Noah, and notorious mean-girl, McKenzie "Mac," take a sudden interest in her and Emily, inserting themselves into the fold. So, too, does Nira's much cooler (and very competitive) cousin Farah. Is she trying to wiggle her way into the new group to get closer to Noah? Is McKenzie trying to steal Emily's attention away from her? As Farah and Noah grow closer and Emily begins to pull away, Nira's trusted trumpet "George" remains her constant, offering her an escape from family and school drama. But it isn't until Nira takes a step back that she realizes she's not the only one struggling to find her place in the world. As painful truths about her family are revealed, Nira learns to accept people for who they are and to open herself in ways she never thought possible. 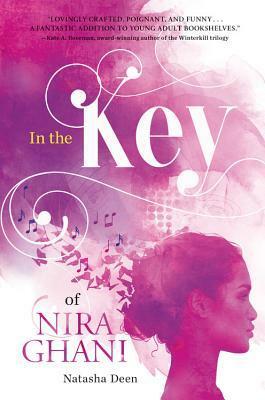 A relatable and timely contemporary, coming-of age story, In the Key of Nira Ghani explores the social and cultural struggles of a teen in an immigrant household. Award-winning author Natasha Deen spent the first part of her life in Guyana, then her family moved to Calgary, Alberta, which she found terribly exciting until her first minus-forty-degree winter day, at which point she began to question the sanity of the grown-ups around her. She currently lives in Edmonton, Alberta with her husband, dogs, and cats, and regularly entices the muses to her office with offers of cupcakes and tea.